The top floor of USF St. Petersburg's parking garage holds the 100 kW solar array canopy. The solar array car port at USFSP. On the first floor of the USFSP parking garage is the Tesla Battery Solar Storage System with the ability to store 250-kW of renewable energy. The energy submetering and monitoring kiosk is also on the first floor of the garage. It allows anyone to learn more about the garage emissions in real time. As USF St. Petersburg works to set new sustainability standards, the campus continues to implement eco-friendly projects. In 2016, USFSP adopted a Climate Action Plan and pledged to achieve two goals: to reduce its baseline greenhouse gas emissions by 50 percent by 2035 and to achieve carbon neutrality by 2050. Edward Lewis is the campus' facilities planning and construction manager. Lewis uses a greenhouse gas baseline inventory tool that is updated every year to track campus emissions. 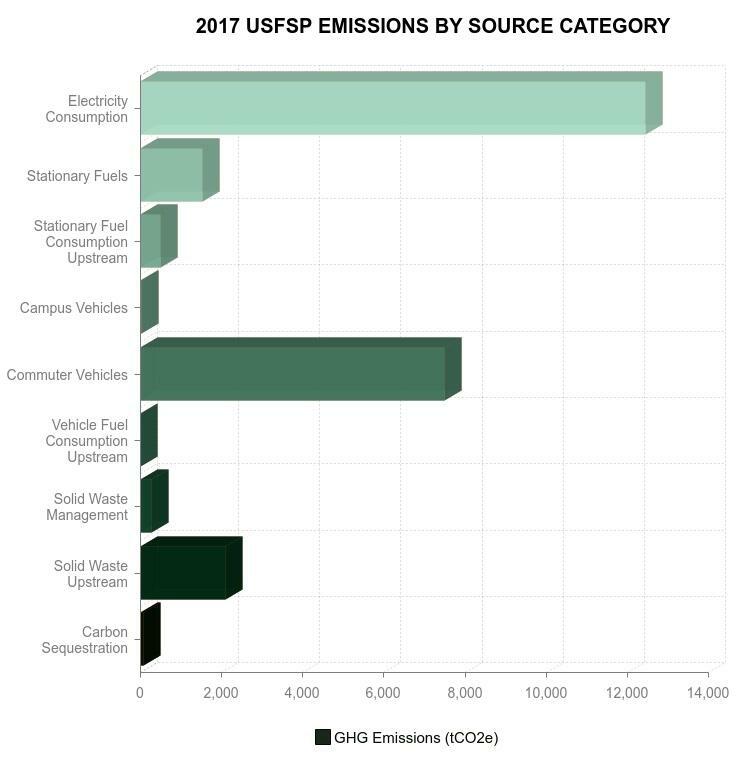 The majority of USFSPs carbon dioxide (CO2) emissions come from electricity, transportation and waste. In order to achieve the goal of carbon neutrality, USFSP is focusing on strategies that would reduce those emissions, both directly and indirectly. USF St. Pete's greenhouse gas emissions from a variety of sources. That includes cutting electricity consumption in half, diverting recyclables from municipal solid waste and adding an additional 500 kW of renewable solar energy. To plan and implement the sustainable projects, the university has partnered with the City of St. Petersburg and Duke Energy. The student body is another main contributor. The Student Green Energy Fund (SGEF) is a student-led group that provides project funding through a $1 per credit hour fee. “Not only does the Student Green Energy Fund help meet those goals of sustainability across our campus, but our sustainability program, other clubs on campus and faculty and staff members help us meet those climate action goals and bring sustainability forward,” said Andrea Rodriguez Campos, chair of the SGEF. So far, the university has completed a number of successful eco-friendly projects, ranging from LED lighting and ceramic window film installations to water refill stations that reduce single-use plastic bottles. Some of USFSP's bigger projects are located in the Fifth Avenue parking garage. On the top floor of the garage is a 7,100-square-foot solar array canopy. It’s a 100-kW array comprised of 318 solar photovoltaic panels that has so far saved more than 325,000 kilograms of CO2 emissions. “It’s powered by our sunny Florida weather and takes in all that energy which powers the entire parking garage,” said Campos. On the first floor of the garage is a Tesla Battery Solar Storage System with the ability to store 250-kW of renewable energy. “It powers the entire parking garage including LED lights, the electric vehicle charging stations, security camera and elevators, and it sends unused energy back to the power grid for usage,” said Emma Jacobs, vice chair of the SGEF. The SGEF provided about $350,000 for the project, while Duke Energy contributed a $1 million grant. “Duke Energy has been a great partner with USF St. Petersburg in unveiling this project as well as contributing to our sustainability goals on campus,” said Jacobs. Also on the first floor of the parking garage is an energy submetering and monitoring kiosk. The digital and interactive system allows faculty and students to scroll through a variety of pages, icons and photos to see real-time data of energy usage in the garage. The three projects in the garage work simultaneously to provide, store and monitor renewable energy. USFSP is also a member of the Association for the Advancement of Sustainability in Higher Education, AASHE. Additionally, it’s a participant in their STARS program which allows colleges and universities to report and measure their sustainability performance. Institutions are scored within four categories: Academics, Engagement, Operations and Planning & Administration. 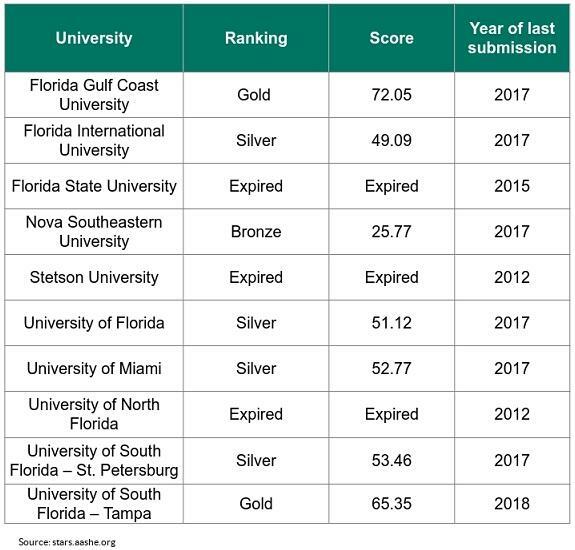 Based on their reporting, institutions are scored and may rank anywhere from bronze to platinum. The chart below represents all of the universities participating in the STARS system along with their score and rank. USFSP has a silver ranking with a score of 53.46. STARS rating by participating universities. Due to USFSP's sustainable accomplishments, they have also received a variety of certifications -- most notably, the Leadership in Energy and Environmental Design, or LEED, platinum certification for the Warehouse Laboratory building. It’s the fourth structure on campus to achieve one of the most popular green building awards. USFSP will continue to renovate buildings to LEED standards. In the works for 2019 is the new Student Residence Hall. Lewis said these projects say a lot about USFSP’s efforts towards sustainability. “We’re progressive, we care most importantly and we want to do something about it,” said Lewis. 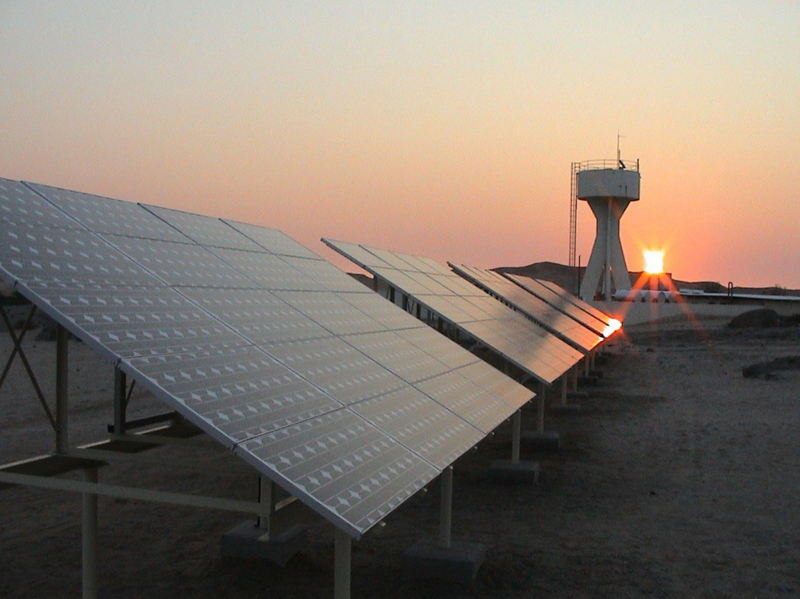 University Beat report on the multiple solar power research efforts being made by USF researchers and students. Florida is called the “Sunshine State,” but we don’t really live up to the name when it comes to solar power. Research by the Solar Energy Industries Association shows that while we’re third in the nation for rooftop solar potential, we’re 14th when it comes to solar capacity that’s actually been installed. The University of South Florida is trying to change that, with ground-breaking research and solar installations at both the Tampa and Saint Petersburg campuses. Near the start of the school year, the University of South Florida held a volunteer fair in the Marshall Student Center on the Tampa campus. While dozens of different clubs and organizations used whatever methods they could to get students’ attention, all four furry members of the Puppy Raisers Club had to do was sit there and wag their tails. The Florida Public Service Commission on Monday gave a key approval to a Tampa Electric Co. plan that will add five solar-energy projects in Hillsborough and Polk counties. African-American history in South St. Petersburg dates back over 150 years. The area known today as Midtown is a community full of native residents who have passed down stories from generation to generation. But, as people pass and memories fade, so can the rich history which lies there.